Go to original pattern for design DROPS 187-29. 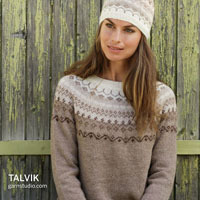 Knitted jumper with stripes. Size: S - XXXL Piece is knitted in DROPS Paris. DROPS DOUBLE POINTED NEEDLES AND CIRCULAR NEEDLE (40 and 80 cm) SIZE 4 mm for rib – or size needed to get 19 stitches and 26 rows in stocking stitch = width 10 cm and 10 cm vertically. See diagram A.1. 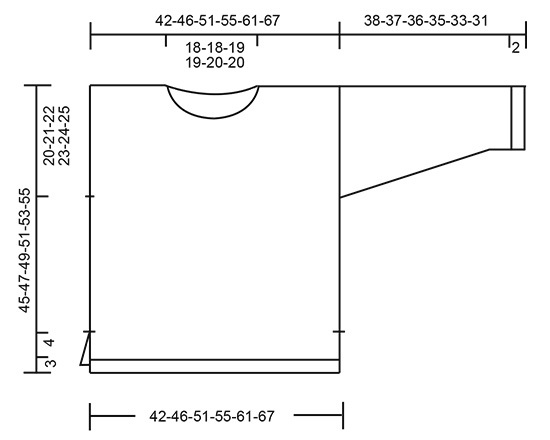 Choose diagram for your size. Diagrams show all rows in pattern seen from the right side. Work the entire pattern in stocking stitch. When diagram A.1 has been worked vertically, continue with mustard until finished measurements. 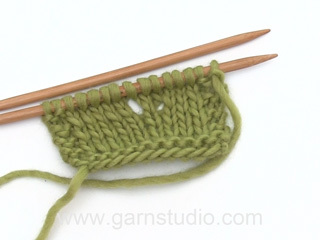 To calculate how to decrease evenly, use the total number of stitches on row (e.g. 84 stitches), minus stitches in garter stitch in the side (e.g. 6 stitches) and divide the remaining stitches by number of decreases to be done (e.g. 12) = 6.5. I.e. in this example work alternately every 5th and 6th stitch and every 6th and 7th stitch together. To avoid a tight cast-off edge you may use a needle ½ size larger. Work front and back piece back and forth on circular needle separately up to vent, then slip piece together and work in the round up to armholes. Then work front and back piece back and forth on circular needle separately. Work sleeves in the round on double pointed needles/a short circular needle. Cast on 84-92-100-112-124-136 stitches on circular needle size 4 mm with dark wash. Purl 1 row from wrong side. Then work as follows from right side: 3 stitches in GARTER STITCH - see explanation above - * knit 2/purl 2 *, repeat from *-* until 5 stitches remain, knit 2 and 3 stitches in garter stitch. Continue with rib and 3 stitches in garter stitch in each side until piece measures 3 cm. Switch to circular needle size 5 mm, and work 1 row in stocking stitch with 3 stitches in garter stitch in each side, AT THE SAME TIME decrease 12-14-14-18-20-22 stitches evenly - read DECREASE TIP = 72-78-86-94-104-114 stitches. Switch to rusty red and continue in stocking stitch and 3 stitches in garter stitch in each side until piece measures 7 cm - REMEMBER THE KNITTING TENSION! Put piece aside and work front piece the same way. Slip back and front piece on to same circular needle size 5 mm = 144-156-172-188-208-228 stitches. Insert 1 marker thread in each side. Then work in stocking stitch with rusty red until piece measures 7-8-9-8-9-11 cm. Then work A.1, read PATTERN above, AT THE SAME TIME when piece measures 25-26-27-28-29-30 cm, divide the piece at the markers. Finish each part separately. = 72-78-86-94-104-114 stitches. Continue with pattern as before and cast in addition on 1 edge stitch at the end of the first 2 rows = 74-80-88-96-106-116 stitches. Work edge stitches in garter stitch. When piece measures 43-45-47-49-51-53 cm, cast off the middle 28-28-30-30-32-32 stitches for neck and finish each shoulder separately. Cast off 1 stitch on next row from neck = 22-25-28-32-36-41 stitches on the shoulder. Continue until piece measures 45-47-49-51-53-55 cm and cast off. Work the other shoulder the same way. = 72-78-86-94-104-114 stitches. Continue with pattern as before and cast in addition on 1 edge stitch at the end of the first 2 rows = 74-80-88-96-106-116 stitches. Work edge stitches in garter stitch. When A.1 has been worked, piece measures 38-39-40-42-43-45 cm. 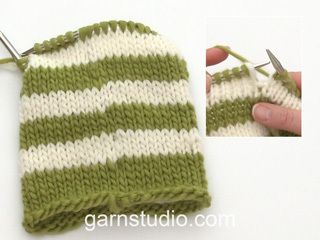 Now slip the middle 20-20-22-22-24-24 stitches on 1 stitch holder for neck and finish each shoulder separately. Continue to cast off for neck at beginning of every row from neck as follows: Cast off 2 stitches 1 time and 1 stitch 3 times = 22-25-28-32-36-41 stitches. Continue until piece measures 45-47-49-51-53-55 cm and cast off. Work the other shoulder the same way. Work sleeve in the round on double pointed needles/a short circular needle. Cast on 44-44-48-48-52-52 stitches on double pointed needles size 4 mm with mustard. Knit 1 round, then work rib = knit 2/purl 2. 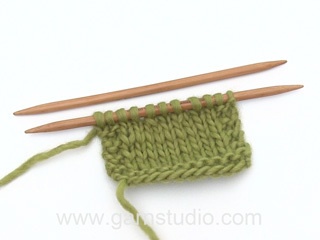 Work rib for 2 cm, then switch to double pointed needles size 5 mm. Knit 1 round while decreasing 4-4-6-4-6-4 stitches evenly = 40-40-42-44-46-48 stitches. Now work 2 rounds in stocking stitch with off white. Then work with mustard and stocking stitch until finished measurements. Insert 1 marker thread at beginning of round (= mid under sleeve). When piece measures 8-5-4-7-5-8 cm, increase 2 stitches mid under sleeve - read INCREASE TIP. Increase like this every 2-2-2-1½-1½-1 cm 14-16-16-17-18-19 times in total = 68-72-74-78-82-86 stitches. When piece measures 38-37-36-35-33-31 cm (shorter measurements in the larger sizes because of wider shoulders), loosely cast off - read CAST-OFF TIP. Work the other sleeve the same way. Sew the shoulder seams. Sew in sleeves inside 1 edge stitch in garter stitch. Work in the round on a short circular needle. Pick up approx. 88-104 stitches (including stitches on stitch holder and divisible by 4) on a short circular needle size 4 mm. 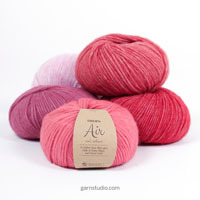 Work rib = knit 2/purl 2 for 2 cm. 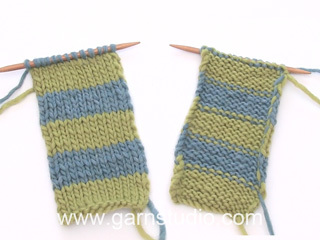 Cast off stitches with knit over knit and purl over purl. Hvor meget garn skal bruges hvis opskriften strikkes i en farve? Eller sagt på en anden måde, kan meterantallet angives pr. farve, så det ikke kun angives pr hele nøgler. Hello, we are sorry you have problems with the pictures, but from our side things seems to be working fine. It might have been a temporary connectivity problem perhaps? Love the idea of this one, it would fit so well in my wardrobe!